A very affordable hotel in a beach location. The hotel is a bit tired looking but clean. I would rather have this at the great price though, rather than a more modern and expensive version. queen bed Instead if a queen bed we had two single mattresses which were hold together by sticky fabric. This created a lump in between making for a very, very uncomfortable sleep. Curtins were ripped and the TV not functional. Very disappointing! Clean and friendly The room was very spacious and clean, especially considering the price, was expecting a lot less for the price so was very surprised. The 2 staff I spoke to while checking in and then out where very lovely and friendly as well. Would definitely stay here again. Everything you need Such a good place to stay for a family. Walked to restaurants at night and the pool was heated. Would definitely stay there again. Great location Nice hotel close to the beach and restaurants. Room was very clean and tidy however, the decor is a little tired. Pool looked lovely and inviting. 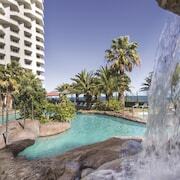 After a sensational place to base yourself in Perth, the capital of Western Australia? Whether you're on a cask wine or top-shelf champagne budget, you'll find the perfect hotel in Scarborough Beach, 12 kilometres from the centre. If it’s your first time in Perth, don't miss Swan Bells Belltower. Don't give up there though. Kings Park and Botanic Garden is another famous sight to strike off your never-ending bucket list. For some serious shopping, spend an arvo at Karrinyup Shopping Centre. There are a few places to crash not too far away. The Quest Scarborough and Seashells Scarborough are popular spots to get some shut-eye. If you want to have a few hours out in the fresh air, play a round at Hamersley Public Golf Course. 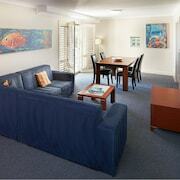 The hotels to check out close to here are the Ocean View Motel and Scarborough Apartments. Holidays! They're about ditching the tinned food and cordial and spoiling yourself. Why not get yourself moving with a strong coffee and a delish snack nearby at Dôme Café? Chances are you'll all be totes starving when dinnertime comes around, so why not make a reservation at Peters by The Sea? Whatever you're craving, the chefs will take good care of you here. If the feast has left you a tad thirsty, El Grotto is practically around the corner. It's an awesome place to pull up a stool and mingle with the locals! 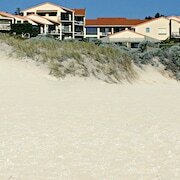 Staying in central Scarborough Beach can sometimes be tricky. There's really no need to stress out though, cos there are options in Sorrento and Warwick. 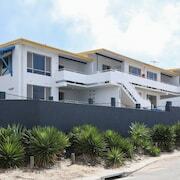 Sorrento is located 7 kilometres north of Scarborough Beach and is home to recommended accommodations, such as the Quality Resort Sorrento Beach and Sorrento Beach Bed & Breakfast. Alternatively, you might like to stay in Warwick, home to the Palms Bed & Breakfast and Arcadian Bed & Breakfast. Warwick is found 8 kilometres to the northeast of Scarborough Beach. We all love take-away food apps and streaming sites, but once in a while you've got to get out of the house! Experience something new on a breathtaking getaway with a little guidance from lastminute.com.au.